the address is: 835 Sunset Dr.
After you've provided all necessary information, your design(s) will be created and emailed to you as a black and white pdf proof. After you've finalized your design, it will then be etched and delivered or shipped by the delivery date. NOTE: If you are doing this for a wedding, shower or Christmas gifts, please give the date you need it by in addition to the wedding date. For example, if you need it several days before because you are traveling or are giving it as a shower gift several weeks before the wedding, please let us know so we don't have to rush to get it to you. What if I'm not sure of the design I want? No problem, we can create three designs for you to pick from. You will then receive an email with a pdf file to look at the designs, then email us back. From there we can make changes. As you will notice some designs will include first names and dates along with the last name. Each of these lines can be added or deleted from the design. We will play around with it and see what looks best. If a design doesn't look very good, we'll let you know and make changes until you're satisfied. This is permanent, so we want you to be happy with the finished product. NOTE: For wedding orders: to help you decide what design to choose, refer to the wedding invitation (you can email a picture of it, either by scanning and emailing or texting it to 402-750-1015, whatever works best for you.) Or if there's some kind of a graphic or verse on the invitation that you would like on the pan, just let us know. I saw somewhere these pans have lids, is that true? The 10 x 15" Pyrex baking dishes, 9 x 13" Pyrex baking dishes, and 8 x 8" Pyrex baking dishes do come with plastic lids that snap right on the top. See below for photos. 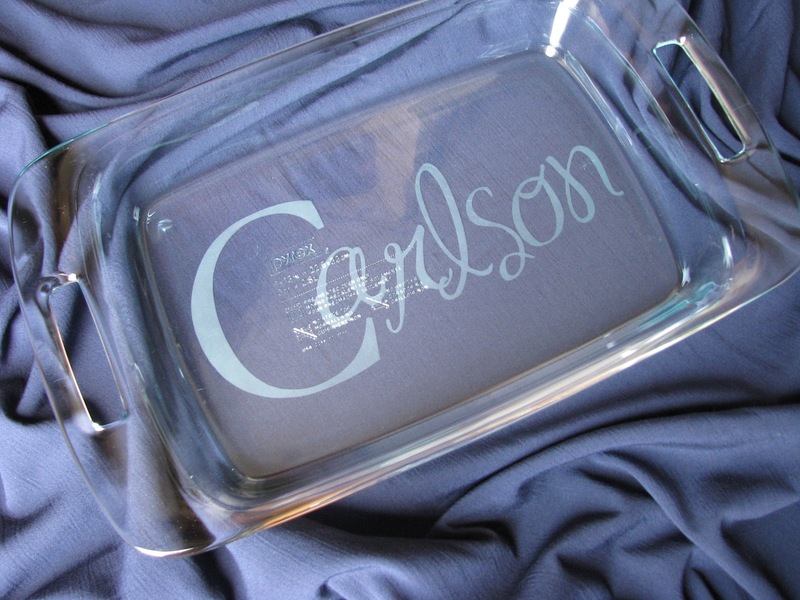 Do you have items on hand to be etched on or do I have to get the item to you? We do currently provide and have items on hand to be etched on. However if you are able to deliver or want to ship us your item(s), you are welcome to do so. You then provide the necessary information for etching and when your order is complete you can pick it up or we can ship it back to you at your shipping cost plus cost of etching (really this varies as to the the item(s) you want etched.) So please inquire beforehand. Remember this is dependent on if you want more than normal etched on a piece, i.e. entire way around a bowl, 2-sides of a glass or vase. 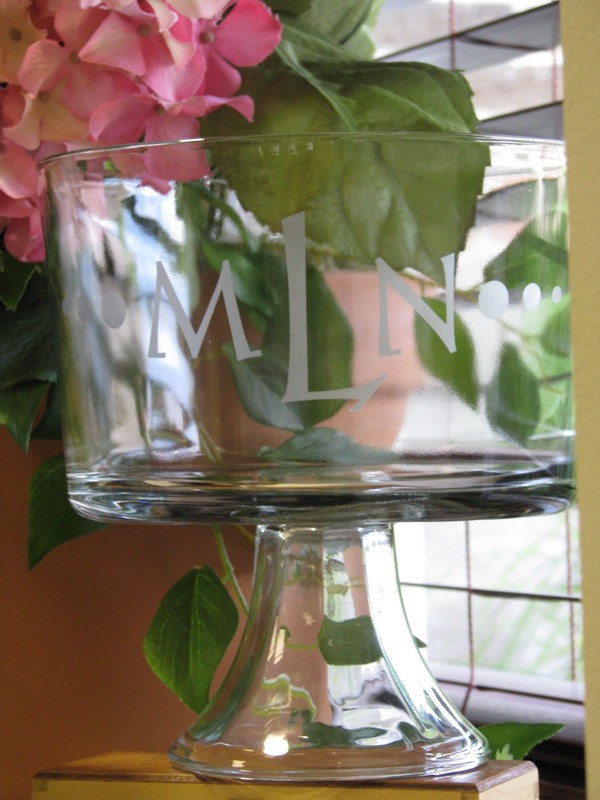 We have done memory vases for weddings with names of loved ones who have passed on. Normally customers provided those vases to us. As there are so many different styles to choose from, at this point we are unable to keep those in stock. If you are interested in this, please email ahead of time. 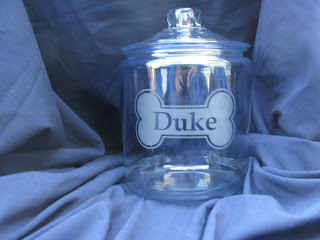 We will need a photo and dimensions of item (always include the lid, placement of wording can be dependent on the lid). If it is a very curvy piece, the minimum price is $60. Please contact us with any other questions. So hard to answer them all, as each customer's piece is different. Just remember to give us plenty of time as etching curves takes a lot of extra time. Does the item I'm ordering need any special care? No, all the items available to order are dishwasher safe. 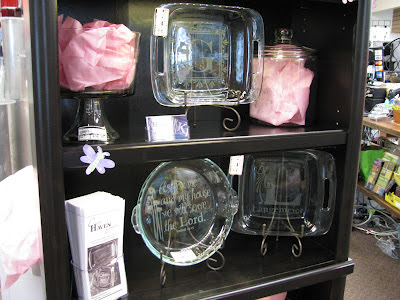 Treat them as you do the rest of your glass dishware or other glass items. Will the design ever wear off? Never! This is a permanent process. If we make a mistake on your dish, we have to start over. Pieces that appear to be glass but are really plastic. We have done some vases that appear to be glass, but really aren't. Sometimes it's really hard to tell. Usually if you take a real glass and ting it against the piece in question, you can usually tell by the sound. If you absolutely love it and you really want that piece etched, by all means take it home with you. The solution: We do have vinyl that looks like etching! Trust me, this stuff won't come off unless you maybe soak it in hot water for several minutes. And it looks amazing! You will not be disappointed. What if you don't offer a design that I would like on my pan? If you would like something new, please email us and we'll see what we can find. We will then email you a pdf proof to be sure it's what you like and proceed with the design. If you can send a link to something you have seen and you'd like something similar, that is a huge help. What are the prices of your items? Currently prices are divided into two catagories: Non-Personalized and Personalized. Non-Personalized is a design that anyone can buy, for example: Live Laugh Love, Give Thanks, Grandma's Cookies and Milk, etc. 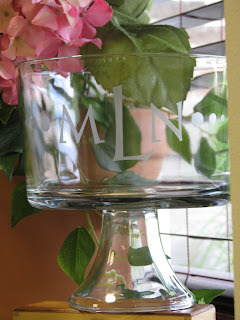 Personalized is anything with a name or initials. 98% of our orders are personalized items. TIP: If it's easier for you to add pictures to your email, feel free to copy photos from here and paste them into an email to me. Especially if you like one design, but the font from a different design. 9x13" Pyrex pan, comes with red lid. 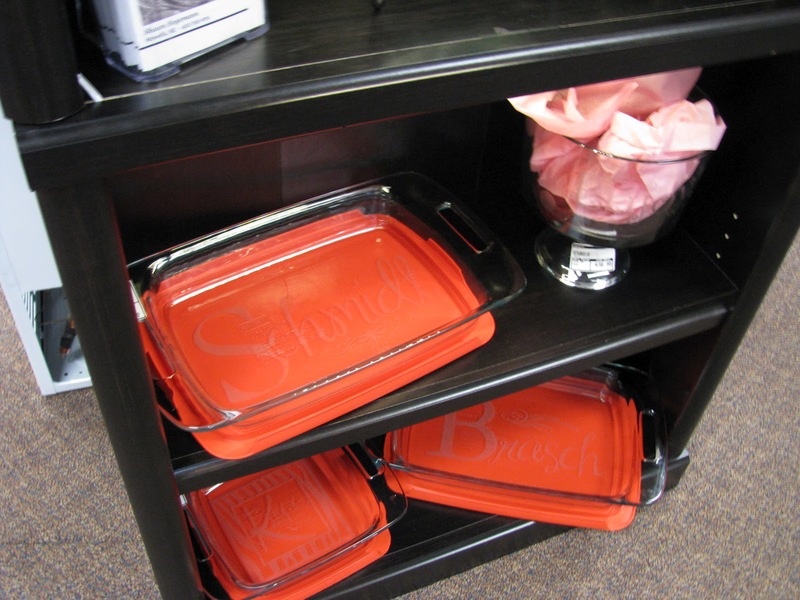 8x8" Pyrex pan is same style, also comes with red lid. More photos to come of remaining items!